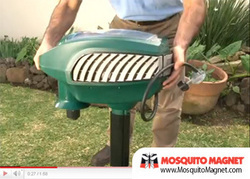 The new Mosquito Magnet trap assembly videos are a great source for easy, step-by-step trap set up and usage. Even though these traps are high-tech, the how-to videos show just how easy it is to assemble and run a Mosquito Magnet trap and reclaim your backyard. Best of all, they’re available to view online at MosquitoMagnet.com and on YouTube/TheMosquitoMagnet. Woodstream Corporation produces Mosquito Magnet® traps, which work by converting ordinary propane into carbon dioxide to attract and kill mosquitoes. The biting insects are drawn to the trap and are then vacuumed into a net where they quickly dehydrate and die. Mosquito Magnet traps work in conjunction with attractants specifically designed to increase your catch rate with these traps. Setting Up the Mosquito Magnet® Executive Trap How-To Video - featured here, it includes instructions on how to charge the battery and how it will last all season. The Executive model features Smart Technology and Woodstream’s patented CounterFlow™ Technology. How to Use Mosquito Magnet® Attractants How-To Video - explains that Octenol is effective in the northern half of the U.S. and coastal areas, while Lurex3™ is better for the southern half of the U.S., which is a breeding ground for the Asian Tiger Mosquito. Setting Up the Mosquito Magnet® Independence™ Trap How -To Video - explains that the Independence model protects up to one acre and runs on four C batteries. Setting Up the Mosquito Magnet® Patriot Trap How-To Video -shows how to use the newest trap, a corded version that protects up to one acre. Additional videos are also found on YouTube/TheMosquitoMagnet, including how Mosquito Magnet traps work, consumer reviews, Mosquito Magnet commercials, and the science behind the product, among others. For more information and to purchase online visit MosquitoMagnet.com. Mosquito Magnet® is the leading biting insect trap in the consumer/residential market and is the only long-term solution that is scientifically proven to effectively reduce mosquitoes and other biting insects. Woodstream Corporation is a long-standing, privately held company and a leading manufacturer and marketer of quality-branded wild bird feeders, rodent control products, caring control products for pets and wildlife, decorative garden accents & natural solutions for lawn and gardens.